I’m taking an involuntary break from school for a while, so in order to keep busy, I’m throwing myself into my music. For the last 30 years, I’ve been a bass player. In 1996, I sold all of my gear to focus on art, and went a great many years not playing. About ten years ago, I picked up an old Fender Precision from a pawn shop for $75 and began noodling with it again. When an opportunity to play in the church worship band cropped up, I got more serious, and bought myself a Steinberger five string, which has been my main instrument for a long time now. Among the things I sold in ’96 was a Rickenbacker 4001. I’ve always regretted parting with that and for years have been trying to find my way back to one. A few months ago, I decided to take up guitar. I picked up a candy apple red Fender Stratocaster, and have been teaching myself chords from YouTube videos. It’s actually been going pretty good. I’m not doing any solos yet, but I can play rhythm for a pretty sizable number of songs. I’m still a bit awkward with it, but I expect in the next few months I’ll be good enough to embarrass myself in front of people. I’ve been pretty dedicated with my practice routine. I had a horrible week with news that I wouldn’t be able to continue with school, and have been feeling pretty down. In a hugely generous effort, my son Kyle bought me a brand new ruby red Rickenbacker 4003 to cheer me up. Words cannot express how much I appreciate this kindness. I certainly don’t deserve it. I’m not such an awesome player that should have one of these based on skill. But it brings a great deal of joy to my daily existence. I grew up with this sound, and my heroes have always been artists and musicians, so to have an instrument like this is just a privilege and an honor, and I am grateful for the gesture Kyle has made. It doesn’t make me a better player, but it certainly makes me want to be one. If he wanted to cheer me up, this was way above and beyond the call! I took it onstage at church this morning, so it was broken in before a crowd a few hours after I received it. 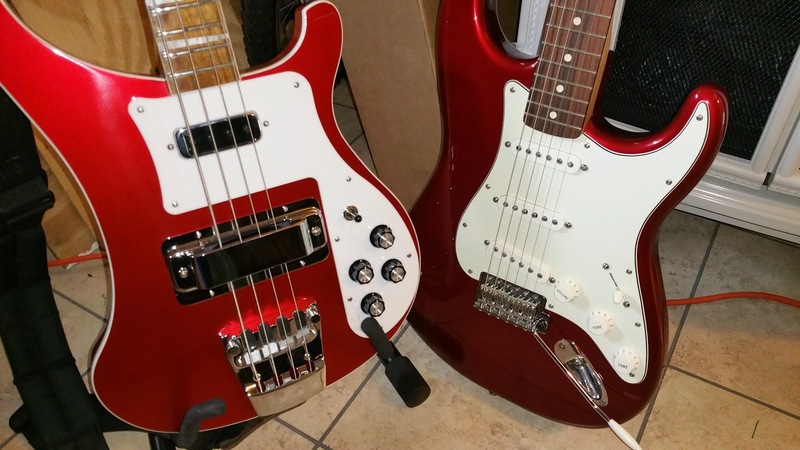 My wife and I are working on our own music projects as a duo and I have great plans for the red instruments in the years to come.